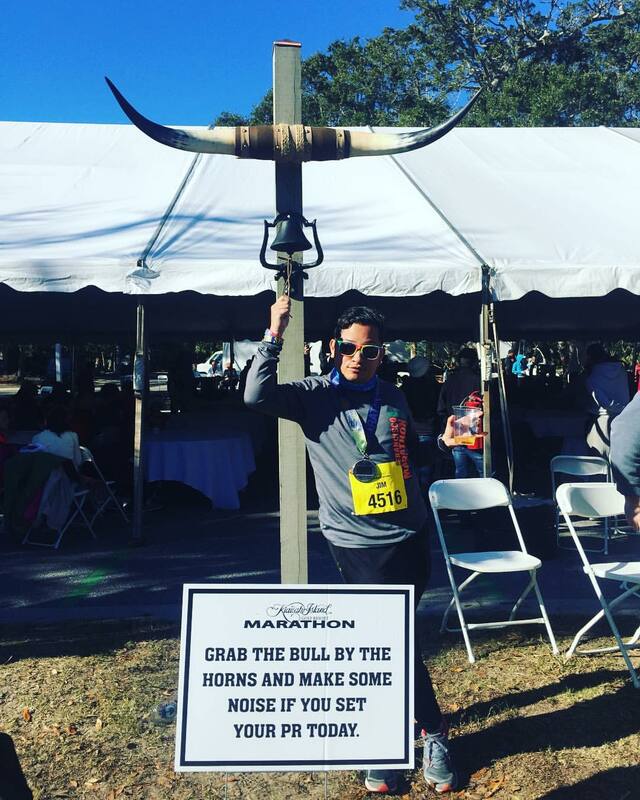 When we last left off, I had just run my fastest marathon of 2016, only a mere 1 minute and 16 seconds off of my PR. We were in Kiawah Island, South Carolina, and were barely there for 14 hours before we were back on the road, as we were headed west to Georgia. 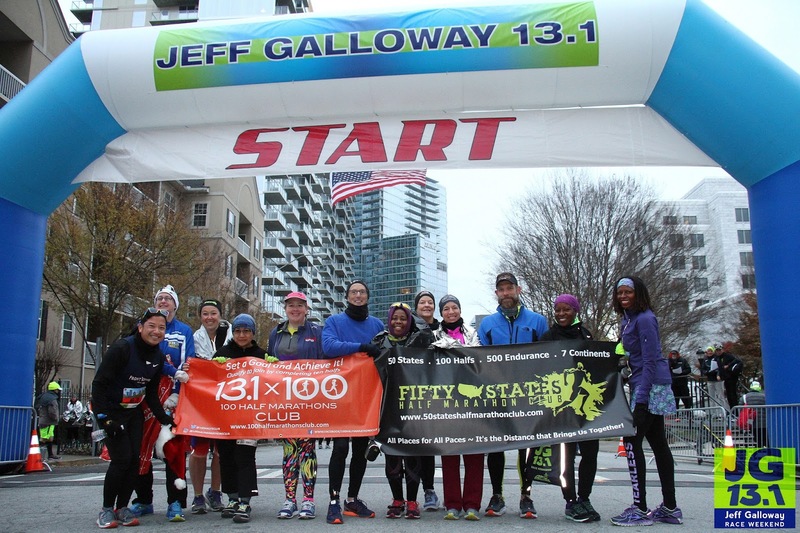 Sunday morning would bring us the Jeff Galloway 13.1, a race that friends from the Atlanta area considered having the flattest course of the half marathons within Atlanta's city limits. 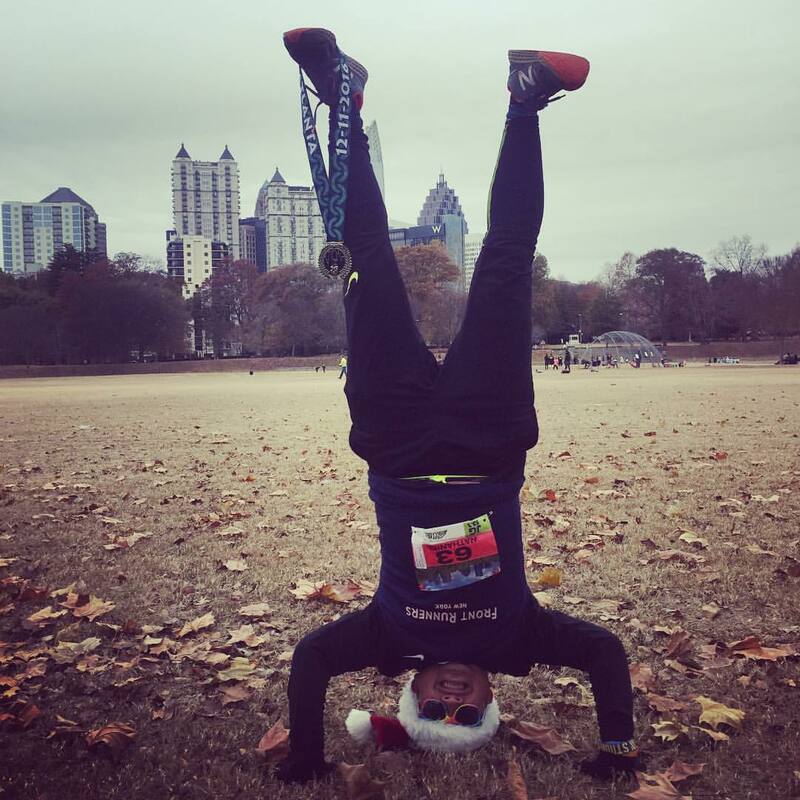 That is saying a lot because Atlanta is notoriously hilly! With two cars - mine and Donna's - we caravan'd over to Charleston airport to drop off my rental, and then got into Donna's car to join her and our friend Andrea on a 5 hour drive to Lawrenceville, Georgia, where we would be staying with our good friend Dave for the night before the half marathon. It was a fun drive, as we were entertained by Andrea's punny jokes the whole way there. We also made stops to eat some absolutely necessary southern-style fried chicken from southern US mainstay, Bojangles. 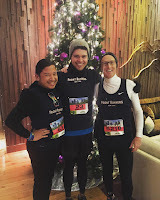 We arrived in Lawrenceville in the evening, and already there waiting was my friend Brenton, who I had connected with Dave back in November during the expo for the NYC Marathon. Brenton is a FRNY member who relocated back to his hometown of Birmingham, Alabama, and I convinced him to come to Atlanta to do the race. We worked out logistics and he came down to Lawrenceville to stay with Dave, too. We called it an early night, as we had to drive about 40 minutes into Midtown Atlanta early in the morning and to find nearby parking. 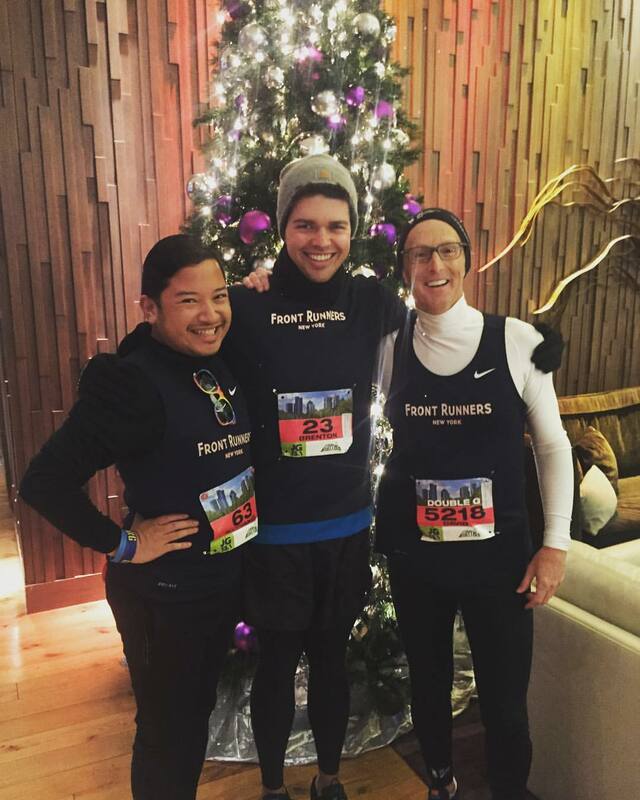 The morning came quickly, and I stretched out my tired muscles from the near-PR setting marathon the day before. 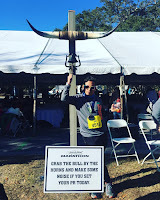 This race was not going to be fast at all, and in fact, I decided that I was going to treat it as my victory lap for running so strongly in my last marathon of the year. We drove into Atlanta, and parked near the startline, close to the Hyatt Atlanta Midtown. We would meet friends Deb and Cozette at the Hyatt, but at the same time I could pop into the VIP breakfast that was happening in the hotel's restaurant. It was a very cold and frigid morning, so we opted to stay as warm as possible indoors before having to go outside and get started with the race. 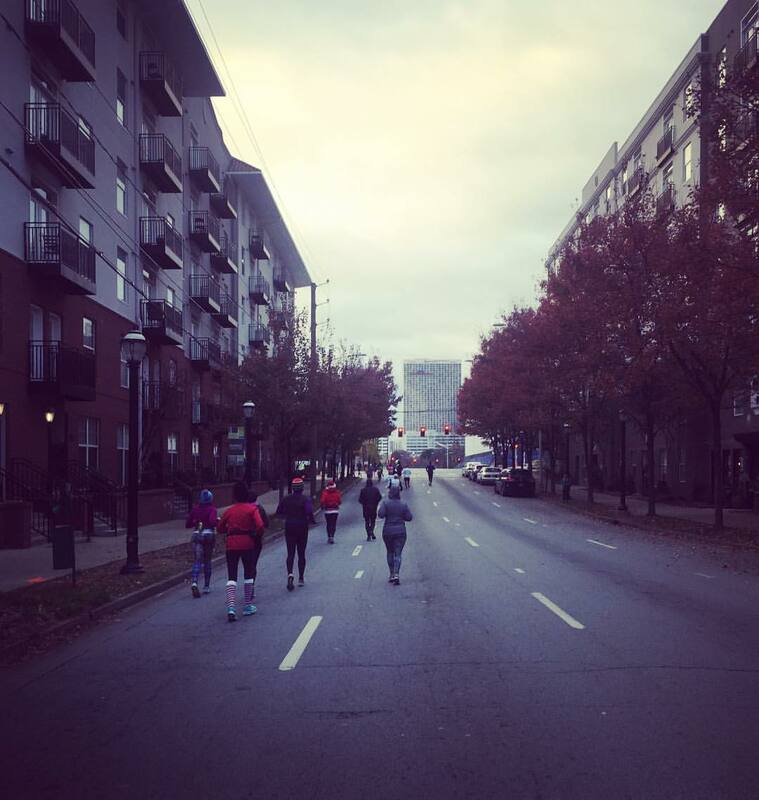 The Hyatt is quite literally right around the corner from the startline at 11th Street NE and Peachtree Walk NE, so we took our time getting ourselves there until we absolutely needed to. 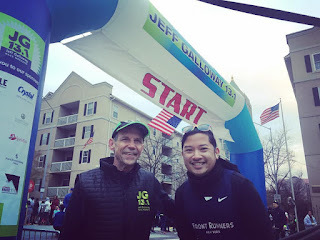 With the race starting at 8am, we made our way outside about half an hour prior, and found the start stage, where I got to chat with Jeff Galloway himself before singing the anthem. The corrals took over each of the three streets leading to the intersection, with the start arch on the other side. I sang the anthem, making it a good one since it would be my last one of the year. 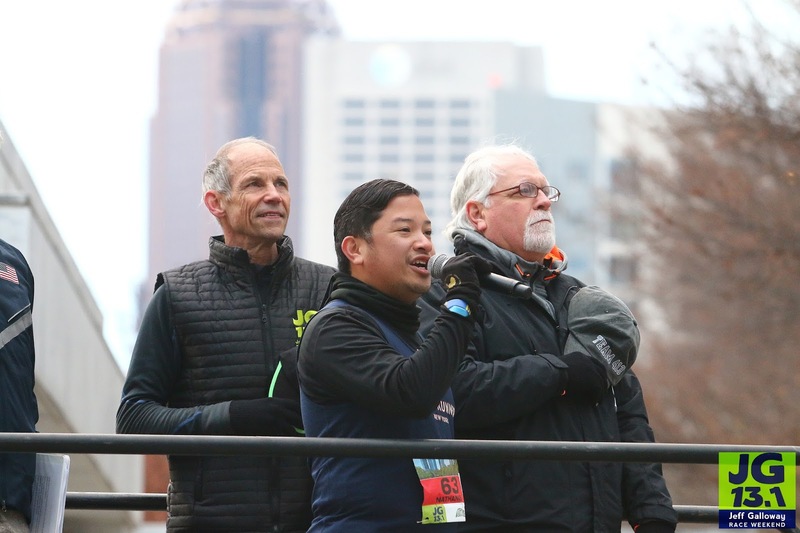 A few days after the race, I'd get an e-mail from my contact with the race, and it noted a review of the race that they had received, which included the following: "One last note, the dude you had singing the National Anthem was incredible. It was a classic, beautiful rendition. 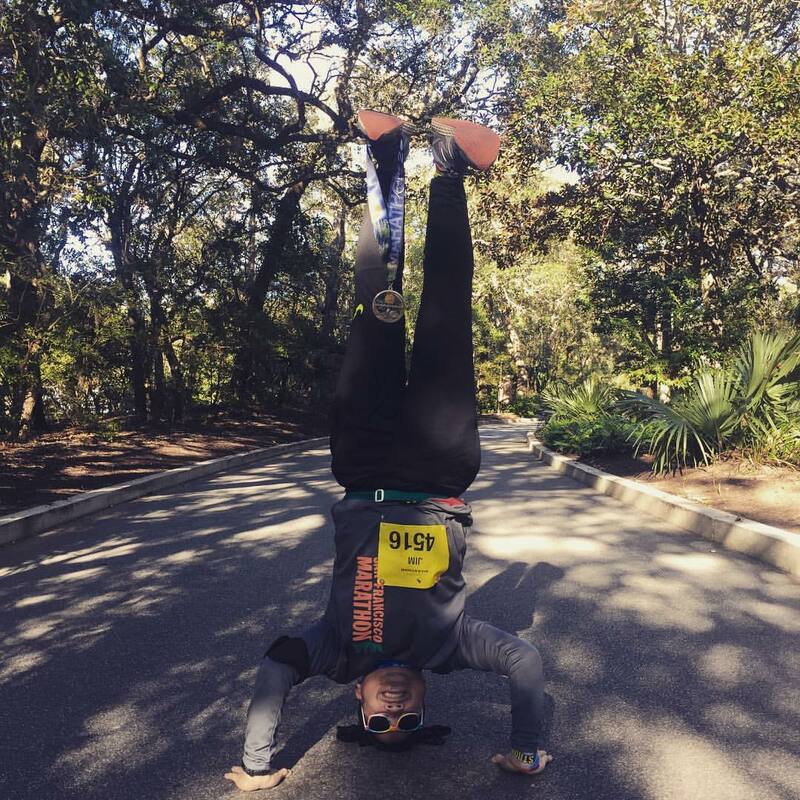 Even as cold as we were at the start, this was an awesome start to a great race." After I sang, we were off, immediately running downhill on 11th Street, losing 57 feet of elevation in about 1/4 mile, before turning right onto Juniper Street NE. 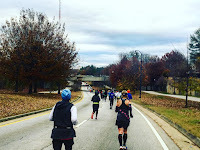 We'd continue for about 3/4 of a mile on a gradually uphill Juniper (gaining back all that elevation we had just lost) before turning left onto Ponce de Leon Avenue NE. My sore legs still managed a 10:30 first mile, as we headed eastward, and then turned right onto Argonne Avenue NE, which turned into Central Park Place NE as we passed North Avenue NE. 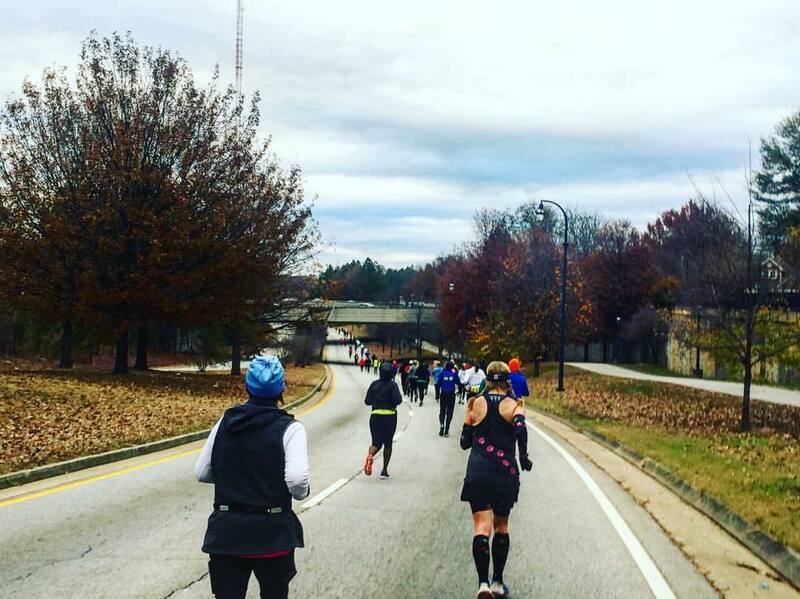 The surroundings quickly became more residential (and gradually uphill, yet again) as we made our way through east Atlanta's Old Fourth Ward neighborhood, an area we'd familiarize ourselves with over the next four miles. We turned once more, left onto the Baker-Highland Connector, which we'd follow for two short blocks, before getting onto the expansive four-lane Freedom Parkway. It was a nice downhill as we progressed eastward, running underneath what appears to be a tunnel - an underpass that seemed to be underneath an unused overpass for a never-built road. We took the next "exit" which was actually the "Freedom Parkway East" that took us right past the Jimmy Carter Library and Museum and Carter Center. 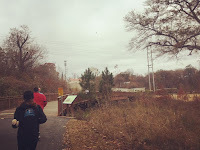 We followed the roadway up to the intersection where Freedom Parkway East, Freedom Parkway, and North Highland Avenue all met, and where an aid station was located, before getting onto the sidewalks that form part of the Freedom Park Trail. This sidewalk, another nice downhill section, would take us straight to a part of the recently developed BeltLine trail system. 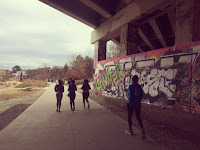 The BeltLine is a former railway corridor that, once finished, will form 33 miles of redeveloped tracks and rights-of-way, that is planned to include a neighborhood-serving transit system (likely streetcars); footpaths for non-motorized traffic, including bicycling, rollerskating, and walking; and the redevelopment of some 2,544 acres, through the expansion of existing parks and the creation of new parks. 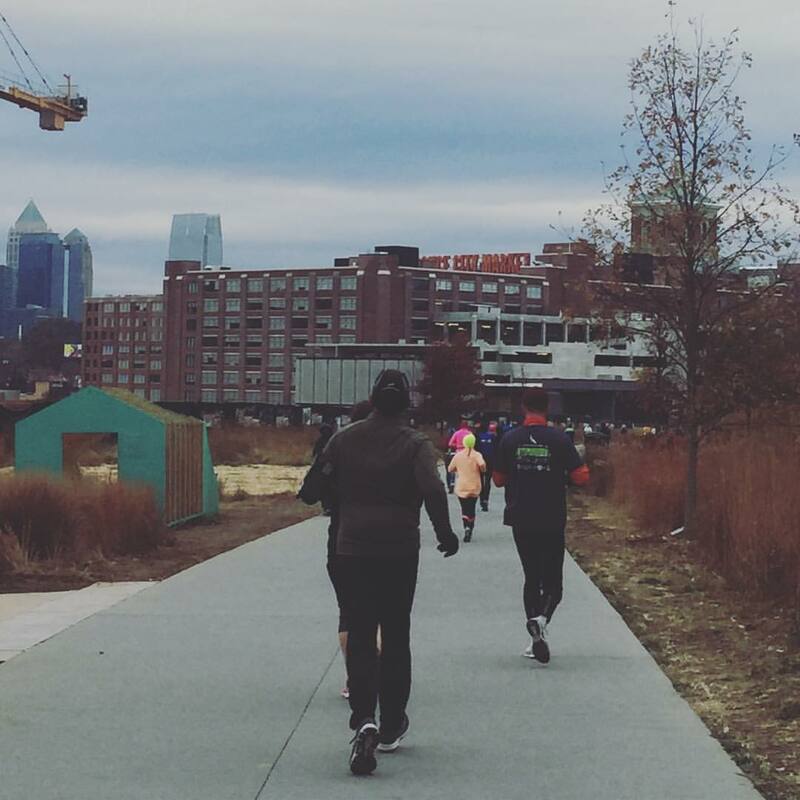 Additionally, multi-use trails will continuously encircle the central part of the city, promoting redevelopment. 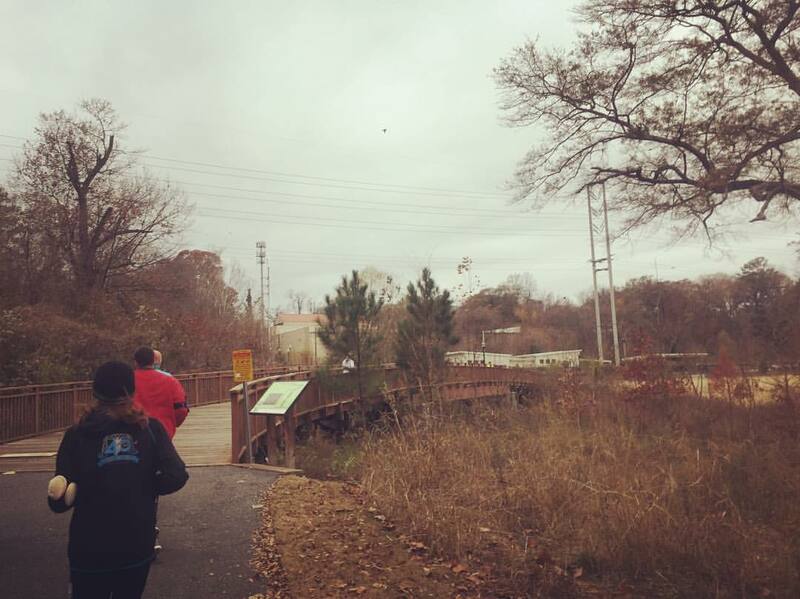 We would enter the Eastside Trail of the BeltLine off of Bernina Avenue and Elizabeth Street, where the trail would go underneath the Freedom Parkway overpass and curve its way northwestward into the Virginia-Highland neighborhood. All in all, we would run about 1.5 miles along the Eastside Trail, being able to admire the beautiful public art and the views of the Midtown skyline in the distance, notably with the Ponce City Market in the foreground. The course then took us on a section that ran through the residential streets of Virginia-Highland, an affluent neighborhood with many bungalows and historic houses from the 1910s to the 1930s. We came off of the trail just past Monroe Drive NE and Virginia Avenue NE, then ran toward Ponce De Leon Place NE, where we turned right. 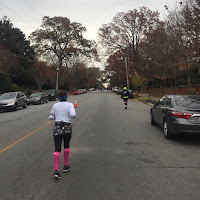 At that intersection, we could see runners coming in our direction that were turning right onto Park Drive NE (the continuation of Ponce De Leon in a northerly direction past the street we were on), and in fact, one of those runners I saw as I turned was Brenton! He looked to be having a good that race, as at that point in time he was two miles in front of me at mile 8.25. Running through the rolling hills of this neighborhood was tough, as I was reaching my tiredness stage from having been up so early that morning. 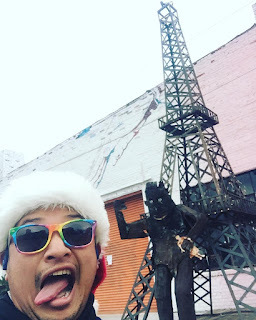 I dropped to a walking pace as we made our way down Ponce De Leon and turning left onto St. Charles Avenue NE, until I was able to regain back my endurance, running longer stretches as we turned left again onto North Highland Avenue NE, and then left again back on Virginia Avenue NE. We took the right onto the curvy Park Drive, then made a left onto Monroe Drive, before we emerged on the southeastern corner of Piedmont Park on 10th Street NE. 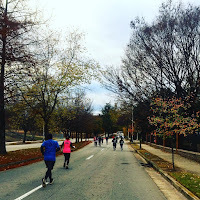 We hugged the demarcated shoulder of the westbound lane of 10th Street as we made our way along the perimeter of the park, toughing it out on this gradual uphill. We turned right onto Piedmont Avenue, and then followed the western edge of the park northward. 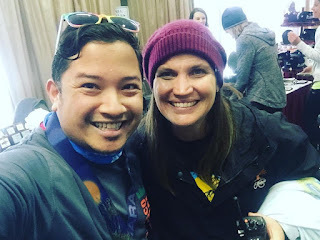 Along the way, I ran into friend and local Atlantan Jessie, and we ran together for the remainder of the race, at that point with only 5k left in the race. We took advantage of the steady downhill that finally greeted us as we were halfway along the northeastern edge of the park, before we were directed to turn into the park from Monroe Drive, and follow the pathways to the finish, deep inside the park. 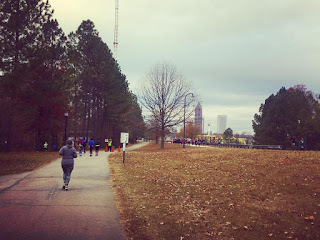 We made our way through the park, curving around the Dog Park and the Park Tavern, using the paved paths and seeing people way on the other side of The Meadow heading toward the finish, eventually making our way around Lake Clara Meer to the finish line near the Sydney Lanier Monument and The Greystone at Piedmont Park. I crossed the finish in a respectable 2:36:18, not bad considering my tired legs. I celebrated inside the Greystone, where a delicious brunch was offered to VIP runners, before returning outside to see friends who were either finishing or participating in photo ops with Jeff Galloway himself. Once all my friends trickled in, we headed back into Midtown near our car, grabbing a bite to eat at Henry's (and having a celebratory drink!) We stopped at Jeff Galloway's running store Phidippides, where I donated my running shoes to close out the year, before heading back to Lawrenceville to shower up. Not long afterward, we headed to Atlanta's Hartsfield-Jackson Airport for our flights home, glad to finish a big weekend of races and for some, like myself... excited to finish the year out strong! 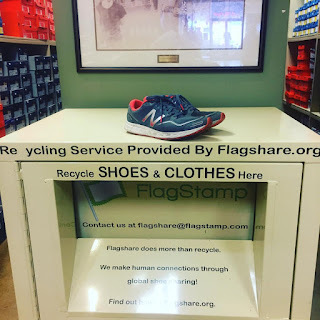 Donating my worn out shoes! My last race weekend of 2016 was a doozy. 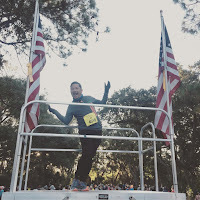 I was scheduled to sing the national anthem and run two races: the Kiawah Island Golf Resort Marathon in Kiawah Island, South Carolina, and then the Jeff Galloway 13.1 in Atlanta, Georgia. On Friday night, after about an hour plus of delays (surprise, it's LaGuardia), I flew down to Charleston, South Carolina. Upon arrival, I pick up a car with my friend Andrea (who had been waiting at the airport for a couple hours already... sorry Andrea) to drive the 40 minutes to Kiawah Island, a barrier island only 25 miles southwest of Charleston. Our friends Donna, Andrew, and his girlfriend Emily, were already fast asleep at the suite at the Andell Inn that we had booked. 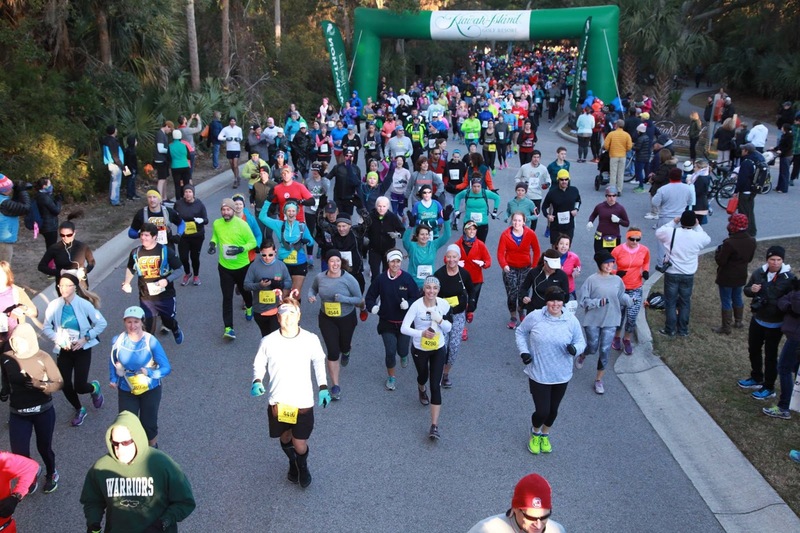 Our race was on Saturday morning, so Andrea and I would be getting in quite late, sleep a few hours and then, with Donna and Andrew, head down to the off-island shuttles at Freshfields Village, which were walking distance from our hotel. Despite being down south, it was a brisk morning... in all fairness, it was December! 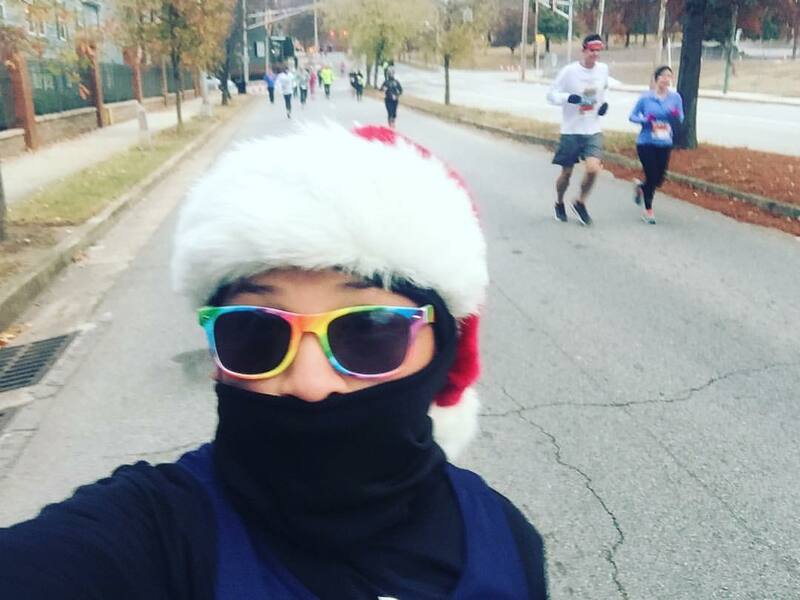 We bundled up to "survive" the expected high 30s temps we'd be encountering on race morning. We hurriedly walked up from the hotel through the cute little main strip in Freshfields Village, then walked across the dewy grasses into the open field just to the east where the buses were picking runners up. The buses dropped us off just north of the East Beach Village Conference Center, where packet pickup was located in the days preceding. While here, we were able to stay inside to keep warm before the race start. 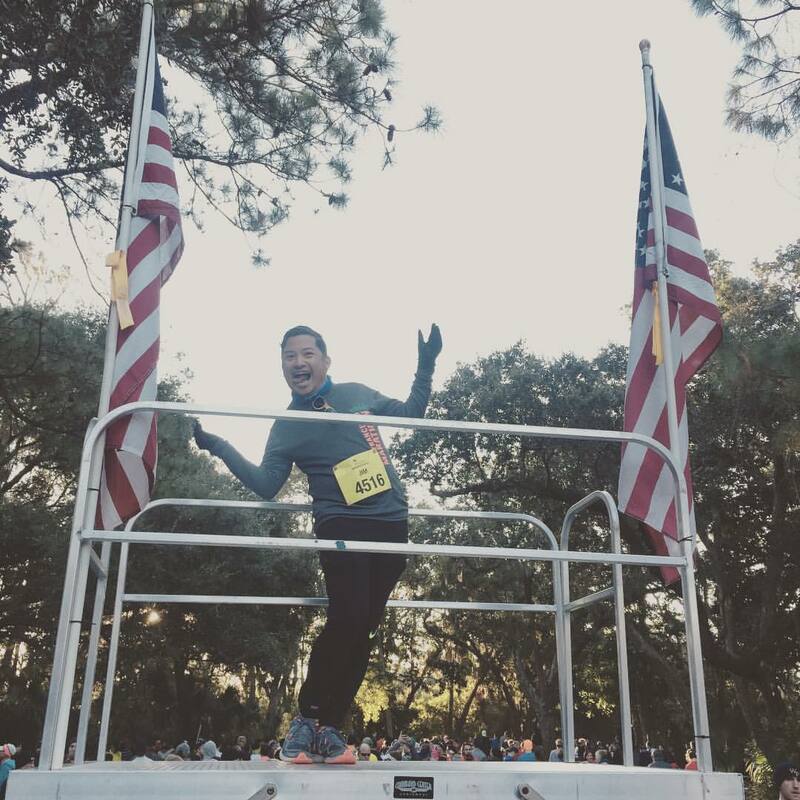 I eventually found my race contact, Jana, standing atop a metal scaffolding flanked by two American flags, set up in the middle of the corrals. This would be where I was going to be standing as well, a different location than I was used to, as I was going to be above seven feet above the runners, and in the middle of the corrals, not right up at the start line. People began to line up in the corrals, and eventually, I got up top after Jana made some announcements, and sang the anthem. We took off at 8am, with the temps at a brisk 37° - a slight 6 mph breeze and some humidity, so it felt more like 33°. It turned out that the timing mats for the start were actually a little before the archway that we were expecting to be the start, so my Garmin was reflecting times only 15 seconds off. 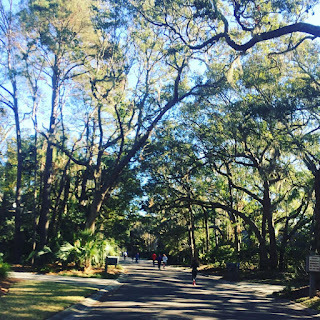 We took off down along Sea Forest Drive, and looped our way heading eastward on Kiawah Island Parkway, making our way along Governors Drive. I was feeling very good and running some strong splits well below 10 minutes, and along the way even managed to see my second cousin's wife Malena on the course. 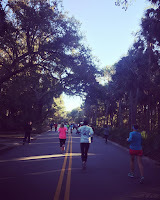 We were surrounded by the beautiful massive oak trees garlanded with Spanish moss all throughout the race. Because I was starting off so well, I extend out my intervals and gradually pare them down as each hour passed. In the first hour, I'd run three intervals - 19 minutes of running with a one minute walk break, up until an hour of the race had gone by. By hour two, I went down to 14 minutes running with a one minute walk interval. Hour three would be 9 minutes on and 1 minutes off, and hour four would be 4 minutes on and 1 minute off, or however my legs were feeling by then. 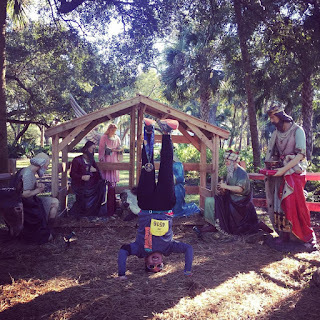 It was a smart course of action, as I was running faster miles at this point in the race than any of my marathons all year. 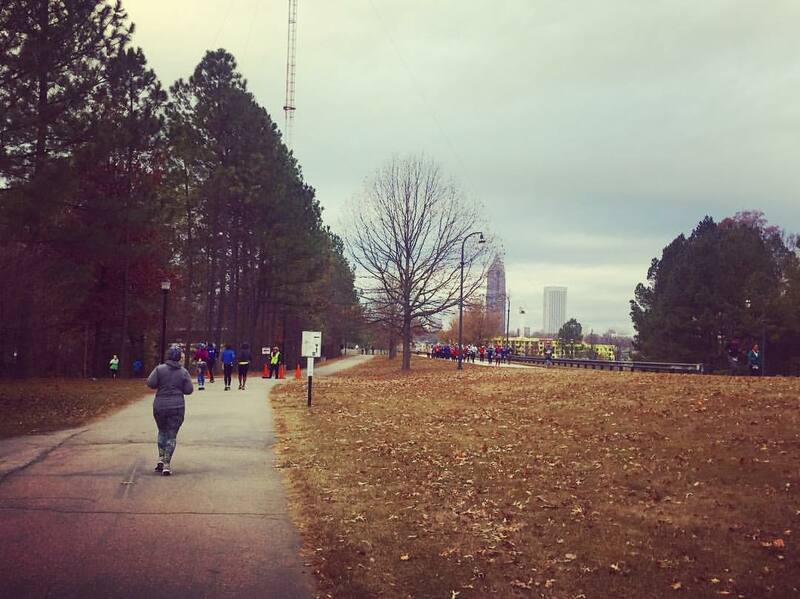 I completed the first 5K of the race in about 29:30. From about the 5.25 mile point, the course took us to its furthest east point in Ocean Park (where there were fewer homes, and they were further apart from each other) along Ocean Course Drive and High Dunes Lane before turning right back around and following bike paths and then Victory Bay Lane as we made our way back along Ocean Course Drive in the other direction. The whole section out here was about 6.5 miles long, and before long, we were headed back into the center of the island. So, the golf resort that puts on this race has been around since 1976, and it has five golf courses, most notably the Ocean Course on the eastern edge of the island. 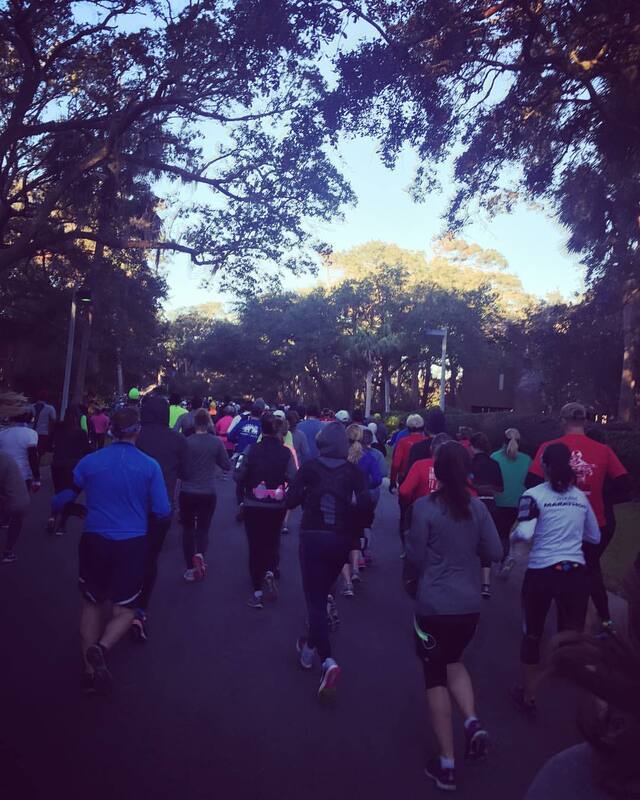 The marathon has operated every year since the golf resort opened, and the course weaves all the way around the island, and around all the golf courses. In fact, the course is a bit of a maze. 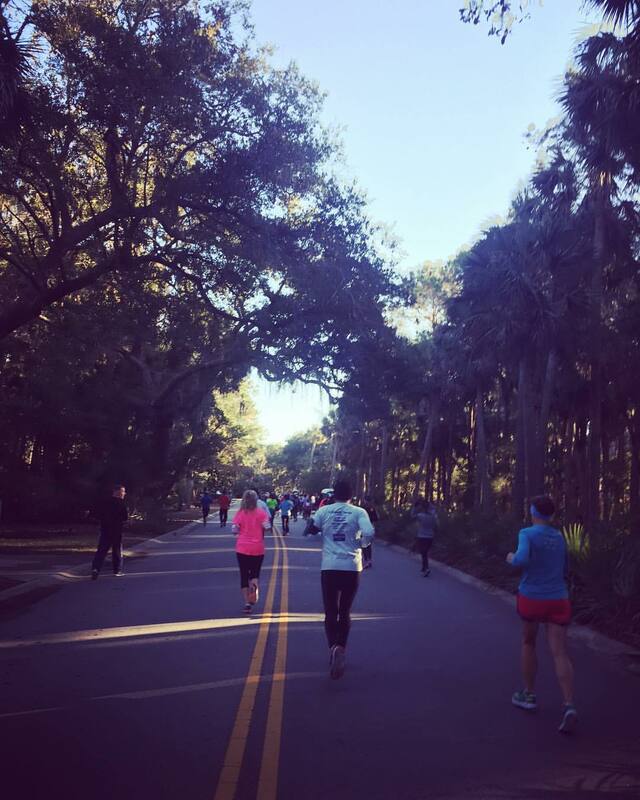 There are many times you will go down a road in the course and have a sense of deja vu because you may have run the same stretch only an hour beforehand. 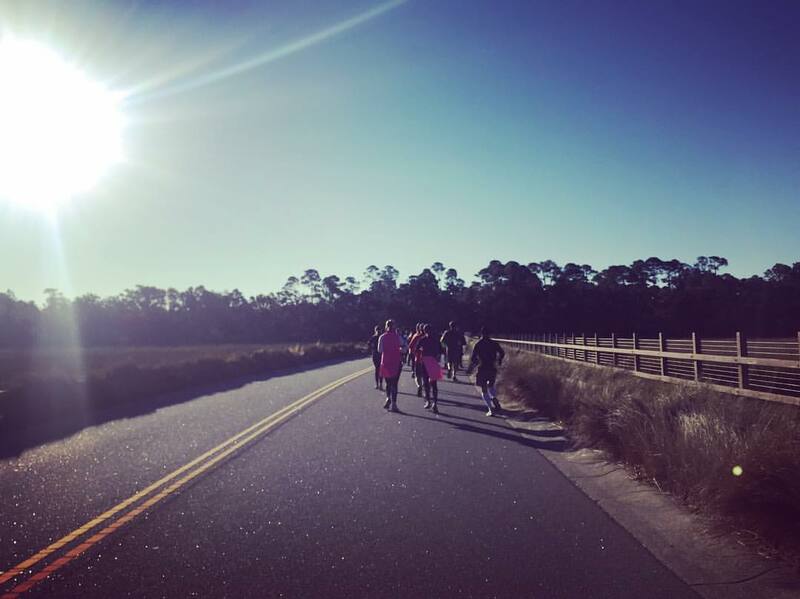 Just before the 12 mile mark, we came off of the out-and-back toward the Ocean Course, and ran along Flyway Drive and then Surfsong Road. 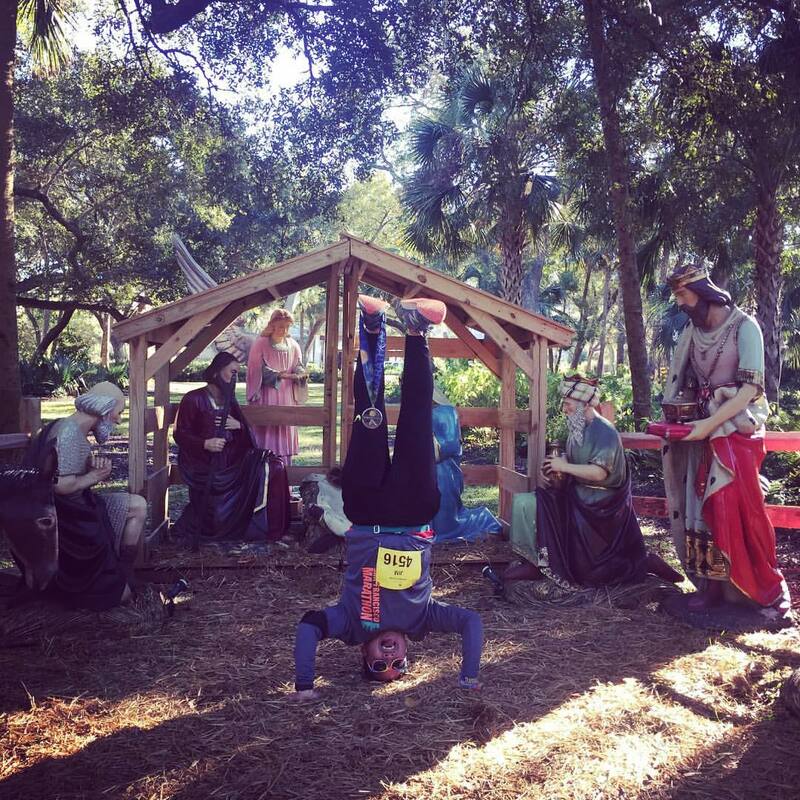 I had a strong first 12 miles, reaching the halfway point of the course in about 2:08. We looped around onto Glen Abbey and then came back to a section of the course where we saw runners coming back toward us in the other direction. By this point, we were nearing mile 15, and I came upon Andrew coming toward me, which turned out to be his 19 mile mark. 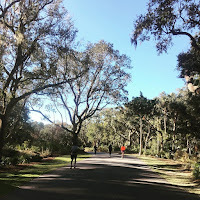 I continued on forward along Bufflehead Drive eastward until we got back onto Governors Drive, looping around on course we had seen earlier, but going in the opposite direction. 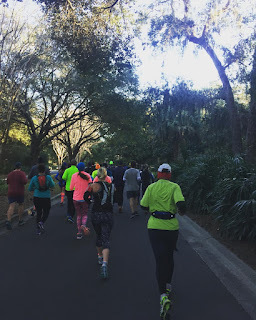 At mile 18, we turned left onto Yellow Throat Lane, following the course south before turning naturally onto Goldeneye Drive, and back onto Bufflehead Drive where I had seen Andrew. After the 19 mile mark, we turned onto a trail that ran parallel to Flyway Drive, and as I took a walk break, the 4:30 pacer passed me. This meant that with only just a little over 10k to go, I was still on par to potentially break my PR for the marathon distance - a 4:38 that I had set a year earlier in San Antonio! I had as much as an eighty minutes to complete the next 6.5 miles. I was getting super tired though - I had begun to run my shortest intervals at that point in time. 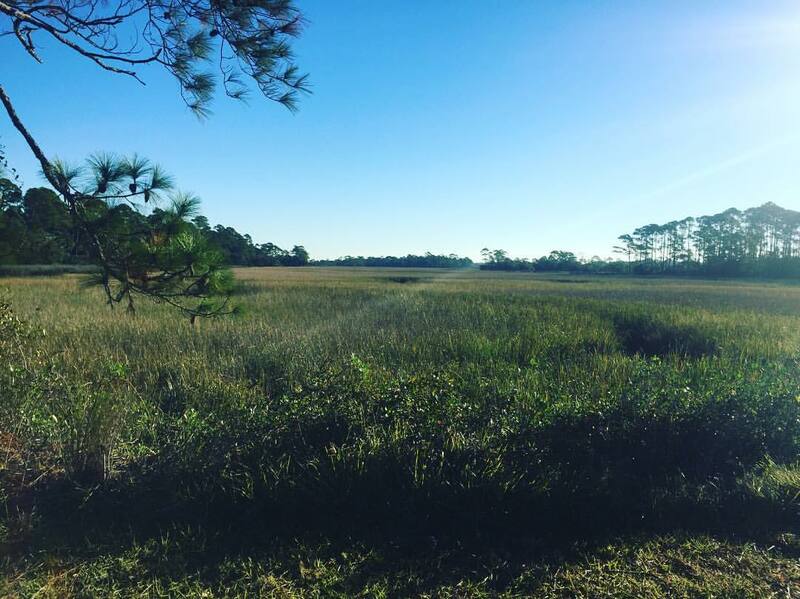 We continued along the trail, which also ran parallel to Governors Drive, and emerged onto Surfsong Road, where we turned left and had six miles to go. The road curved along paths between the golf courses, and I could've sworn - didn't I see this set of trees before? After a series of turns, we made our way past the shoreside of a pretty resort area - including the pool, and boy I would've loved to take a dip - we passed some gates, and then all of a sudden the surroundings looked somewhat familiar - we were back in East Beach Village, and close to where we had passed the startline less than four hours ago. The minutes kept ticking by, and my watch beeped at me, signaling the 4 hour mark. 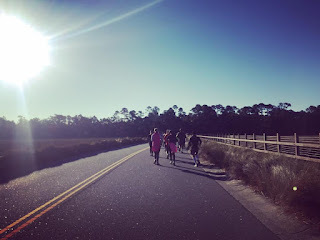 I looked down, and my watch showed 23.06 miles, as we ran down Eugenia Avenue, a mere few hundred feet from the ocean. Just 5K to go now. That meant, even if I took walk breaks, I could still break my PR if I maintained a 11:30 per mile pace. We kept on, but my legs were so tired! We headed back onto one of the golf course paths, and hit mile 24. 12:01. Not good enough... pick it up a little, Jim! 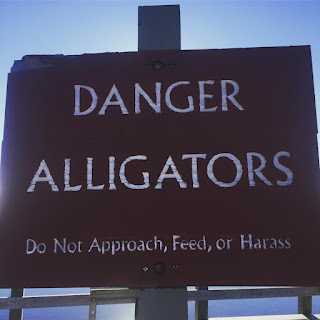 We emerged back onto asphalt and turned right onto the curvy Greensward Road, another right onto Surfwatch Drive, then left onto Palm Warbler Road. 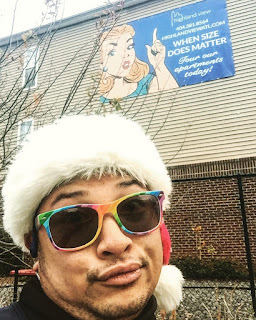 Mile 25 beeped by. 11:40, and 4 hours and 23 minutes in. Still very possible. I have 14 minutes or so to finish this race and set a PR, knowing full well that my watch times were only a few hundred feet off of the posted mile markers. 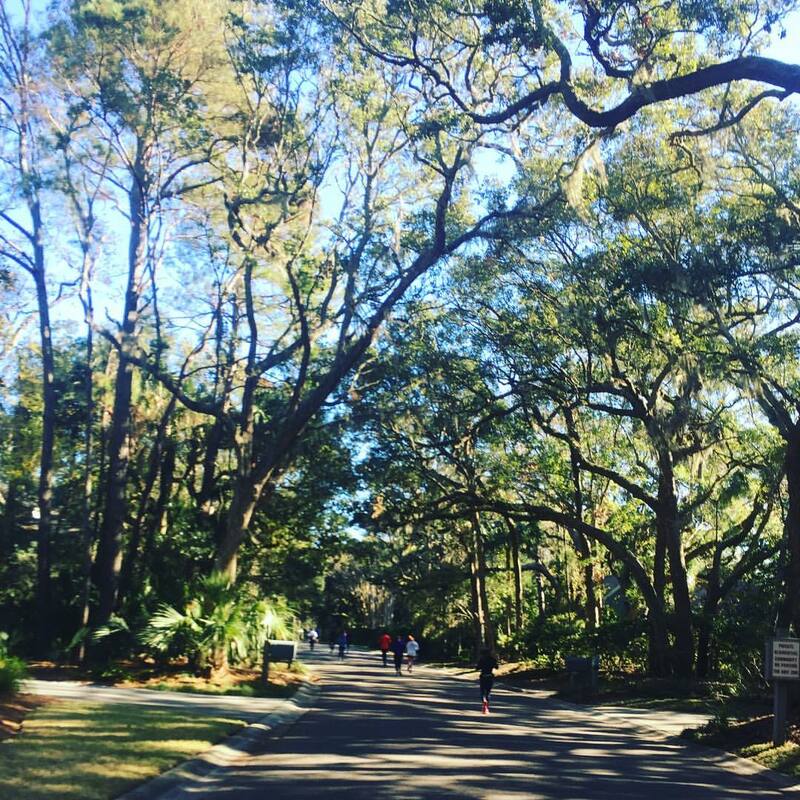 The last mile was so tough, as we ran down the tree-covered trail that ran right alongside Kiawah Island Parkway. I was extra hard on myself too, because I had started out so strongly. However, I shouldn't have been discouraged at all; after posting a strong time last week in Rehoboth Beach, Delaware, where I posted my second fastest marathon time, I was about to do it again, and very likelier - finish even faster. I could hear the music coming from the finish line, but I couldn't dare look down and see what my time was. 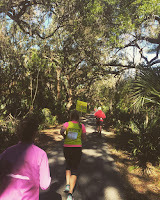 I came out of the woods onto Sea Forest Drive, and not too far in front of me was the left hand turn to the finish, in front of the East Beach Village Conference Center. I glanced down at my watch as I made the turn. 4:38 and change. Darn it. I had passed my PR time. But I was about to finish... and I crossed the finish line in a victorious 4:38:37; only a mere 1 minute and 16 seconds slower than my PR, but nearly 2 1/2 minutes faster than last week's. I had a new PR for the year - at my 20th and final full marathon of 2016! A victory headstand for my second fastest marathon time!